Just an update to the post we did about Village at Deaton Creek way back in 2007. It is now 2014 and the community is nearing completion at 1100 homes within the next six months or so. The board of directors is starting to include residents. The community is firmly established with over 100+ clubs and groups. New homes for still being built but not for much longer. 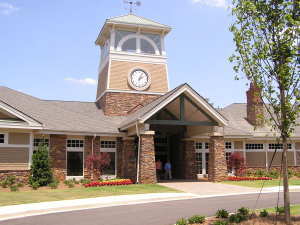 It is one of the most successful 55+ communities in the Atlanta area. Mary Ann and I visited the Del Webb active adult community The Village at Deaton Creek this week and were very impressed with the new activity center which opened last week and the model homes. The Village at Deanton Creek is located north east of Atlanta. For locals it is up I-85 on the exit for Chateau Elan and Road Atlanta. This whole area has become a great area for active adults. The activity center is a good name because club house does not do justice to this 35,000 square foot building. It is the largest of its kind in Georgia. All the features and activities reminded us of being on a cruise. The lifestyle director gave us a tour. We were not ready or expecting such a wonderful facility. It has everything. The communities marketing material has this say: This active adult oasis, known as The Club at Deaton Creek,” has been specifically designed to enhance and expand the active lifestyle for our current and future residents.” They are not exaggerating. This is one of the most appealing 55+ communities in Georgia, no doubt about it. The entrance is grand and has a registration/service desk and lounging area like a lodge you would see out West maybe in Yellowstone or Montana. Soaring ceilings and wall of glass to the back overlooking the terrace and the river. The Grand Ballroom is huge and could be separated by rooms but I could see a community gathering for a dance or party taking place here. At one end a group of about 30 residents were playing bridge when we attended. At the other end of this large ballroom was a professional cooking demo room, like you would see at Whole Foods. The crafts room was actually two colorful rooms and had facilities for ceramic making including a kiln. Also a library/Wall Street Room with wireless Internet access. The fitness area was huge, again set up like on a cruise ship only much bigger. Nautilus equipment arranged to look out through the walls of glass. Flat screen TVs and plug ins for music and video. At the end of the building was a Junior Olympics size indoor heated pool. Adjoining locker and changing rooms were beautiful. Outdoors there are upper and lower terraces just outside and part of the activity center overlooking the natural area and river. Seating groups of wicker were arranged. Good place to sit with friends or by yourself to read a book. This area reminded us of a lodge we stayed at last year in Alaska. Oh, at the end is a huge outdoor swimming pool. We did a home made video if you would like to take a look. This is our first video so please overlook the technical part but I think it will give you a good feel for the activity center. With this community, you get both the advantages of a an active adult community and also small town living, even though it is part of metro Atlanta GA.